Public: Indexed; available to all. This group type is just as it says: all published content is available to anyone & everyone visiting your site. All published content is indexed and will appear in search results. Use when: you want your content to be easily accessible & searchable. Restricted: Indexed; available if in the right IP range, authenticated via LibAuth, and/or with the password. This group type is almost like Public, except that anyone visiting your site has to have the right access permissions in order to see the content. This means being in the IP range(s) set for the group, authenticating with the LibAuth authentication rule set for the group, or having the password. All content is indexed, so it will appear in search results -- but only if the user is within the accepted IP range(s). To view content in a restricted group, the user must similarly be within the accepted IP range(s), authenticated with LibAuth, and/or have the password. Use when: you want to limit access to the content of your group. Internal: Not indexed; available to account holders. The type of group is the most restrictive. 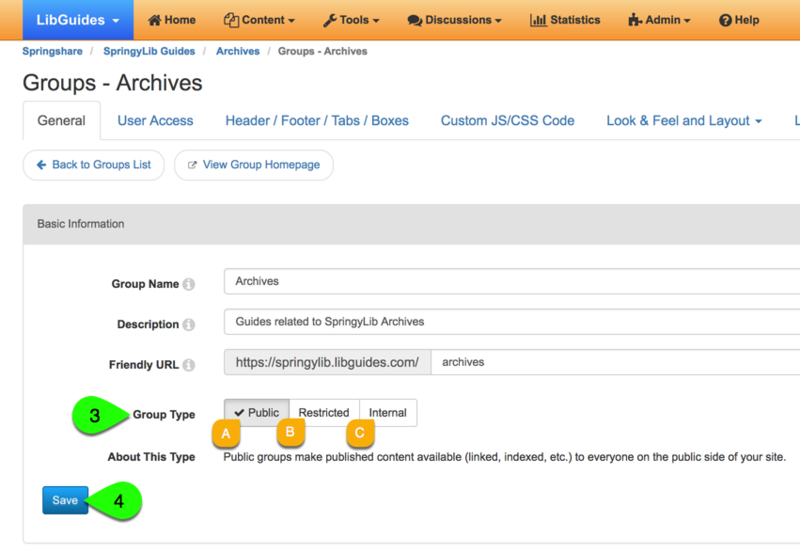 In order to even view content in an internal group, a user must both be logged into LibApps and have at least Read-Only permissions in the group's User Access settings. When a logged-in user has access to an internal group, its guides will still display throughout your LibGuides site in guide lists and search results. If a user is not logged in or does not have access to the group, they will not see any of the group's content. Use when: you only want account holders to have access to the published content. Note: only admin-level accounts and regular-level accounts with admin permissions for the group can customize the group's settings. When the Restricted type has been set for a group, you are presented with options for setting up what those restrictions are. Access to the group's settings is not restricted when only a password is set. Click the Add Rule button to set up new IP-based restrictions for access to the group. Access to the group's settings is restricted to only the approved IP ranges for the group. IP restrictions can also be set up and managed from Admin > System Settings > Access Rules tab > IP-Based Rules box. Note: LibAuth-based restrictions for a group are set up and managed from Admin > System Settings > Access Rules tab > LibAuth Authentication Rules box.